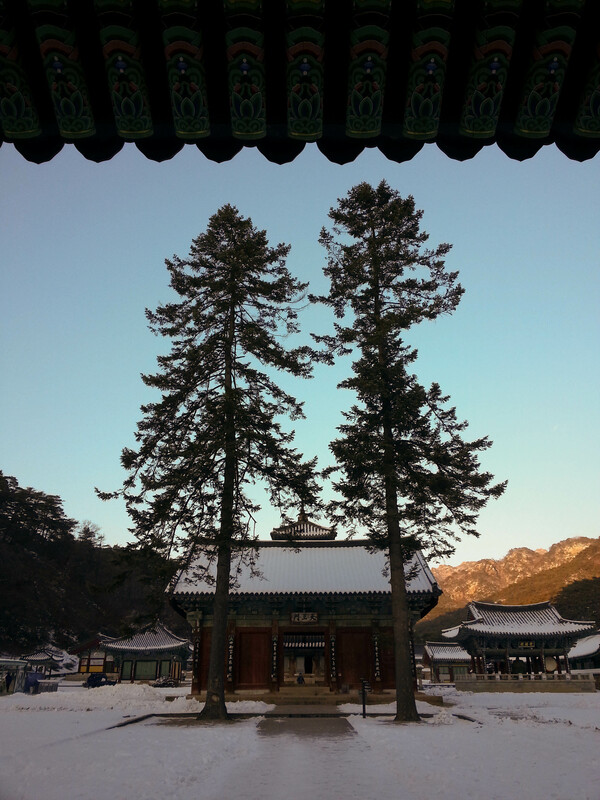 I was recently given the opportunity to experience a temple stay program at Beopjusa, a beautiful Buddhist temple located in Songnisan National Park. 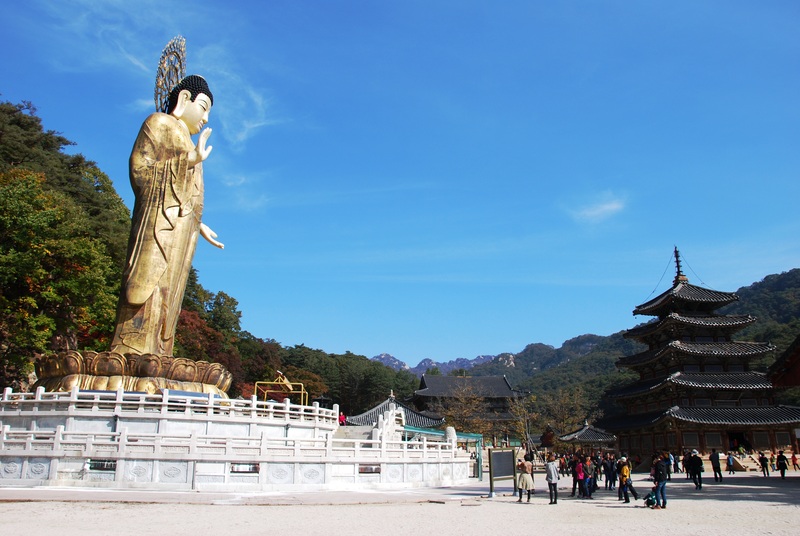 Since 2002, temples throughout Korea have been offering this program to anyone interested, regardless of your background or religious beliefs, to experience the culture and gain a deeper understanding of Korean Buddhism. Usually they consist of one or two nights at the temple, following the schedule and simplistic routine of the monks and nuns that live there. 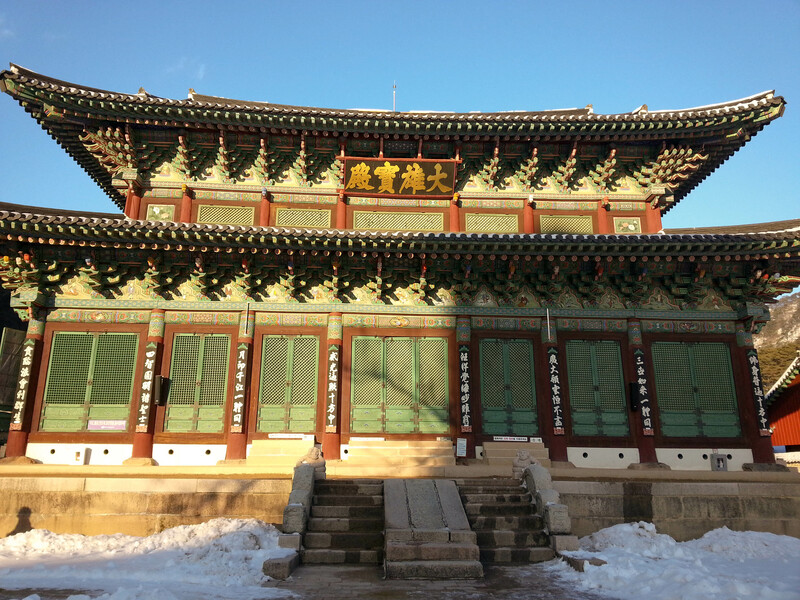 It was a really great cultural experience, and I’d recommend it to anyone visiting Korea. Upon arrival in the early afternoon on a Saturday, we were given temple clothes to wear (pants and a vest in a muted purple color) and assigned to rooms for our stay, which were quaint, clean and empty except for a few books on Buddhism and bedding piled in the closet. After settling in and taking note of the sign on the door which read, ‘Beware, wild boars have been seen roaming the temple yard!’ we were given a tour of Beopjusa. 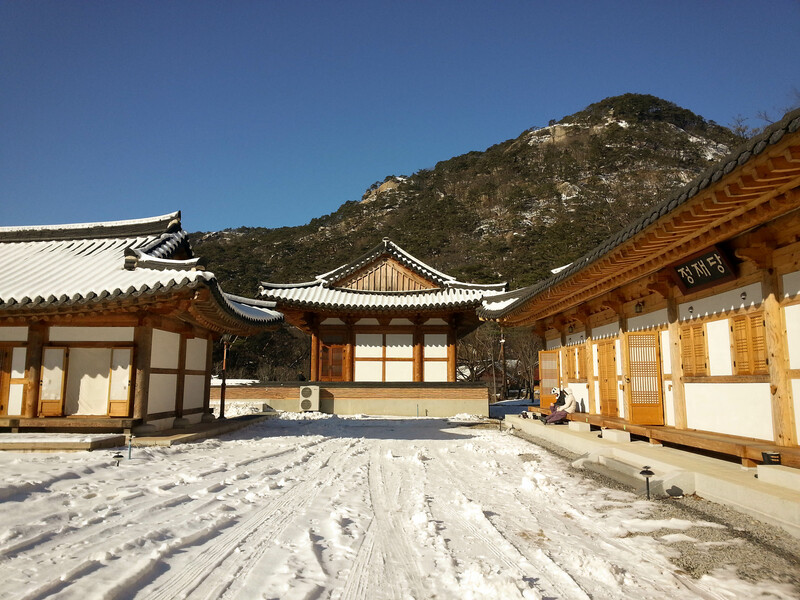 This was actually the third time I’d visited this temple—once in the spring, once in the fall and now the winter—and each time it has been equally beautiful. Originating in 553, almost all of Beopjusa was burned down during the Japanese invasions in 1592, but reconstructed in 1626. The oldest remaining written history of the temple grounds is dated 1630 and describes what existed before the Japanese invasions, mentioning 60 buildings, 10 stone structures and 70 hermitages. After reconstruction in 1626, there were only about 20 buildings. Since then, there have of course been many reconstruction and restoration efforts, making it a beautiful, spiritual space 1500 years after it was first erected (there’s your history lesson for today). After roaming the grounds freely for a while, we were called to dinner which was eaten in silence. It was served buffet style and consisted of lots of vegetables, tofu, soybeans and rice, (Korean Buddhists don’t consume anything animal related). We were told it is very important that not even a grain of rice be wasted at the temple, as this is a way monastic practitioners show their thanks and gratitude for every aspect of food growth and preparation, so everyone was sure to only take what they would eat. After finishing the healthy meal, we washed and dried our own dishes and headed back out into the cold winter night for the evening chanting ritual in the temple with the resident monks. I felt lucky to be witnessing such a spiritual moment, although I must admit I couldn’t stop thinking about how cold my feet were (no shoes allowed) on the frozen temple floor. After my feet started to feel numb, we headed to the heated meditation hall to make paper lotus lanterns to wrap up the day. For monks, the day starts early and ends early. Lights out is strictly set at 9pm. I’d unintentionally stayed up way too late the night before, so going to bed that early wasn’t actually as hard as I thought it would be. My alarm went off at 3am the next morning—that was hard. The day began with the morning chanting and drumming ritual at 3:20. Again, it was a beautiful sight, but wow, my hands and feet were so cold, not to mention it was so early! I was happy to learn we were heading back to the heated meditation hall afterwards for morning zen meditation. I have not spent much time practicing meditation, but after this experience I feel like it’s something I’d like to incorporate more of into my life. We started with 20 minutes, and I was surprised to find it went by rather quickly. We were instructed to count to 10 continuously, focusing on our breath, pushing any thoughts that entered our minds away. It was not easy, but I felt very refreshed afterwards. Following the meditation practice, we did 108 prostrations, or bows, of repentance. The idea behind this, especially first thing in the morning, is that it helps your body and consciousness become one. Each bow, corresponding to 108 compartments of the mind, was in unison to an audio recording in English, reminding our humble selves what we can do to realize our “true self”. Let me tell you, 108 prostrations is quite a workout for both the mind and body. After breakfast, which was basically the same as dinner, we participated in a traditional tea ceremony lead by the first female monk to live at Beopjusa (she also lead us through the meditation and prostrations). She was so kind and her English was excellent. Before heading outside into the woods for a long walk and walking meditation exercise, she lead a very intriguing question and answer session. She revealed that she was raised Christian and it took some time for her family to accept her decision to become a monk. Now, here she is, making history as the first female to reside at this temple. 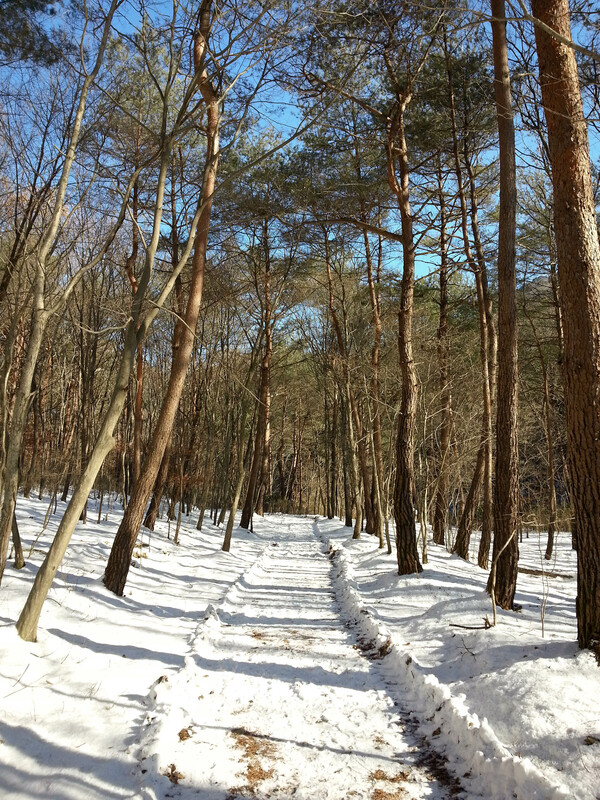 While I only spent roughly 24 hours at Beopjusa, I walked away feeling very calm and revitalized. There is something very restorative about the quietness and simplicity of life on temple grounds. I wouldn’t mind trying whole experience all over again, except next time I’d pick a warmer season. Our rooms were in the building on the right, a recent addition to the temple grounds. 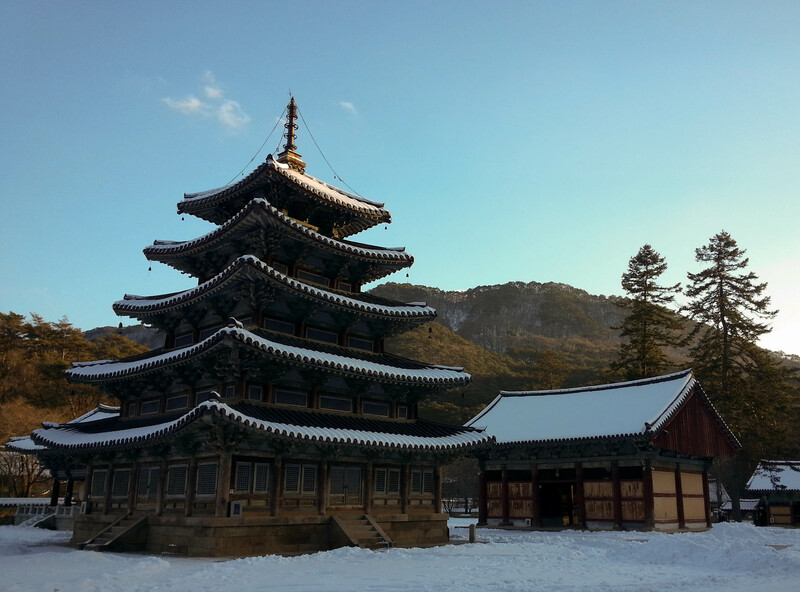 Palsangjeon is the oldest and tallest wooden pagoda in Korea. The outside of the temple where the chanting rituals took place. The giant gilded bronze Buddha was covered up during the temple stay, I assume for restoration purposes. This picture was taken in the fall. 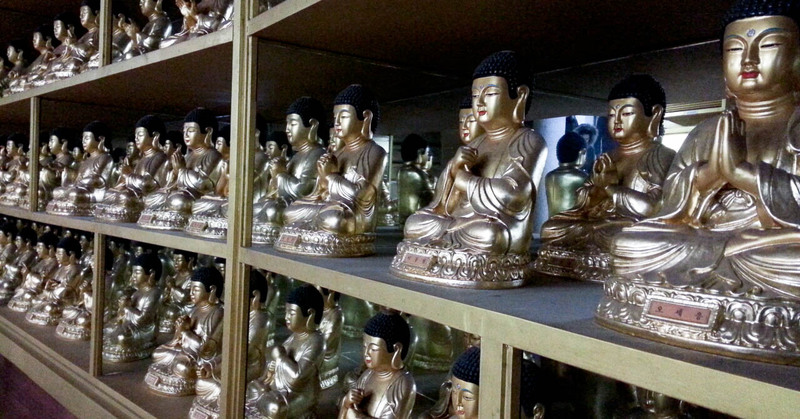 Beneath the giant Buddha rest hundreds, perhaps thousands, of smaller statues of Buddha. We made lotus flower lanterns out of rice paper. 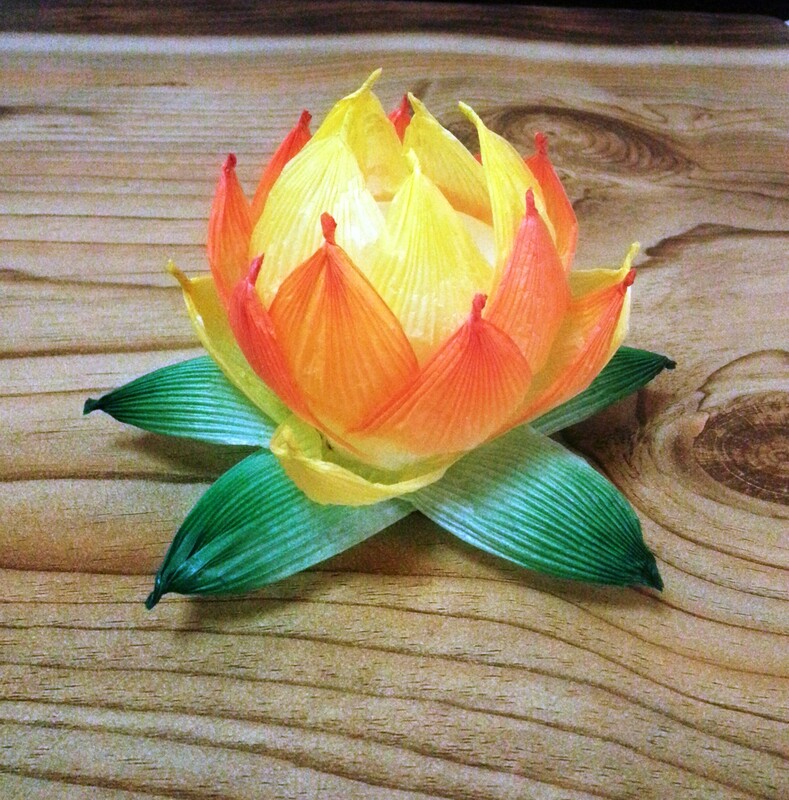 The lotus flower, which blooms from muddy waters, represents purification, faithfulness and enlightenment. 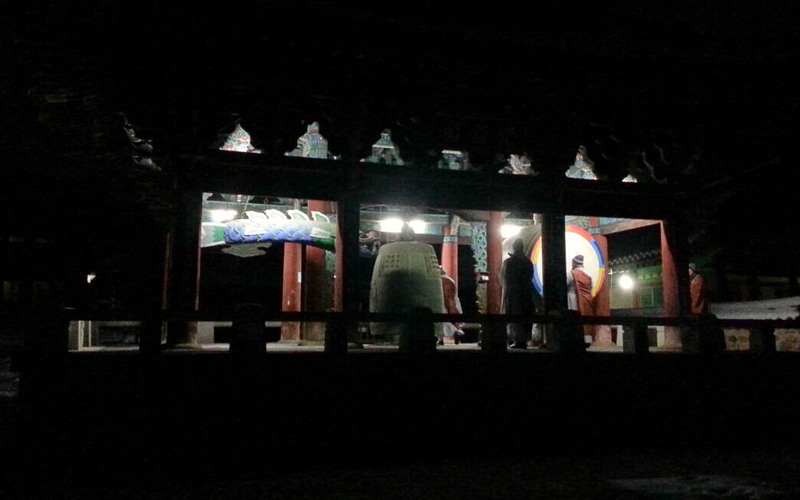 The morning drumming and chanting began at 3:20am. 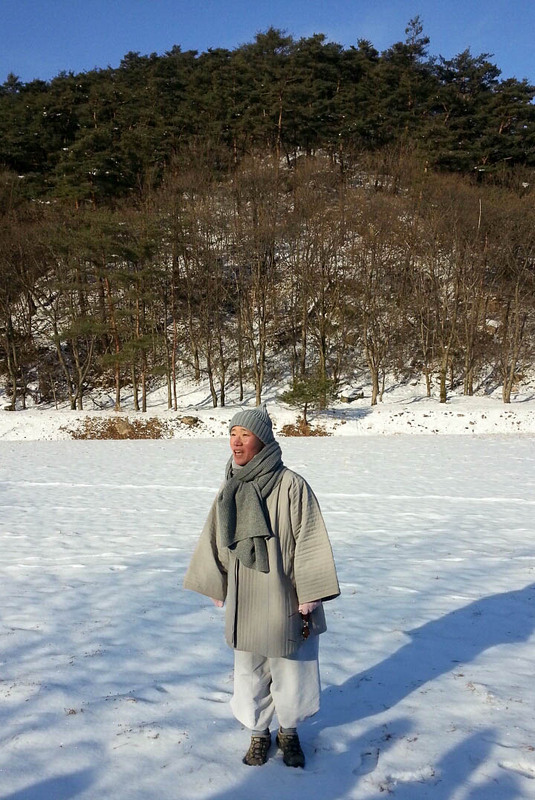 The first female monk to ever live at Beopjusa, about to lead us on a walking meditation through the woods. 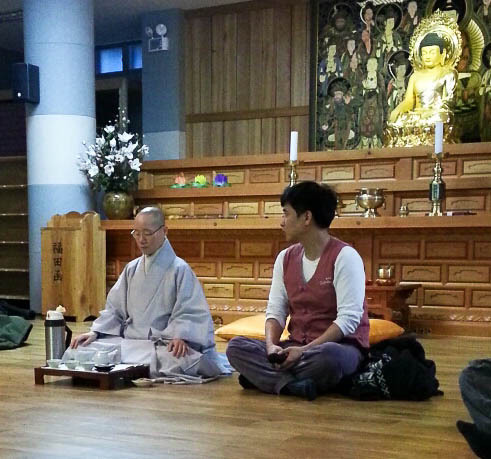 Sunim (the title for a Korean Buddhist monk) showed us the customary way to make, serve and enjoy tea. 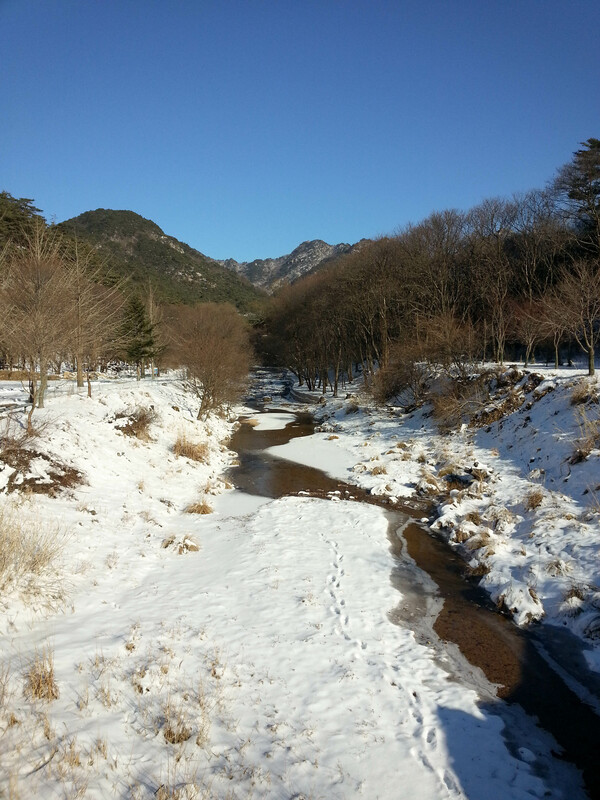 A cold, tranquil day at Songnisan National Park. I caught myself comparing my life to others as I was reflecting on 2014. It’s not a healthy thing to do, I know this, but with social media it’s sometimes hard not to. I love seeing what friends are up to and it’s certainly a good way to stay in touch and share the joys of life when you’re separated by mountains and oceans, but at times it has caused me to question where I’m at in my life. This past year, my Facebook and Instagram feeds were full of marriages, engagements, babies, new home ownership and career success—all things that don’t appear to be in the near future for me but are currently happening for everyone my age, or so it seems. 2014 did not pan out the way I’d envisioned it to at all. Most people can probably say that, however. It was exciting, challenging, scary, frustrating, and at times quite lonely (the cockroaches I’ve been sharing my apartment with aren’t very good company). I moved to Korea without preparing myself for what would happen if I didn’t love living here. The possibility of not loving it just didn’t cross my mind. I don’t mean for that to sound like I haven’t enjoyed myself, because I really have, and I’m incredibly grateful for my experiences here. In no way do I regret the decision to pack up, sell everything and move here. I still sometimes wonder why and how I even got here, but I’m glad I did, despite all of the unexpected difficulties. The other day I received an email from a friend who mentioned how much respect they had for me for being so bold and adventurous. It’s funny how much a simple statement like that can mean. Bold is not a word I would use to describe myself, and it’s like it made me suddenly realize whoa, I totally moved to the other side of the world. I’ve received plenty of encouragement from my family and from David and those that read this blog (thanks, guys 😉 ), but something about hearing those words from a friend far removed while I’d just been thinking to myself I could have been a stronger person this past year, made me feel pretty good. I did not accomplish or experience the things my friends did last year, or perhaps it’s just the things I’m longing for, but I do think my year was equally great in a very different way. This year I will always remember to focus on living my unique, extraordinary life. I will appreciate the here and now and what is right before me. My time in Korea will come to an end in just over 6 weeks, and a lot of unknown lies ahead as I face living in a new city and begin the search for a new job, possibly a new career. I am trusting that my life will pan out as it’s meant to, and I will savor each chapter along the way. 2015, I am ready for you. I have a feeling it’ll be a good year.